Lexden Terrace 2 is a luxurious, imposing mansion house with amazing sea views and private access to the beach through the beautifully set out communal gardens with castellated walls. This row of 6 houses are described as "Tenby's finest Terrace". 2 Lexden Terrace Grade 2 Listed Georgian house built in 1843, with shared access through gates and parking for one car. The property has been sympathetically restored keeping many of the Georgian features of the house but with all the modern conveniences, large comfortable rooms with quirky hints of it's past as well including shutters for all the windows. The master bedroom is a delight with arguably the best view from a shower in the County! Many of the windows have fantastic views of the sea, beach and the Napoleonic fort on St Catherine's Island. Step through the large sash window onto the private patio and relax soaking up the superb views of the scenic coastline and Blue Flag beaches. This amazing house sleeps 10 - 12. The house also has a separate self contained basement apartment that sleeps 2 available to book additionally, if you have a larger group of 13 or 14 people. This apartment is NOT included in your booking of K793, unless you ask to add it and pay the associated rental. The pricing to include the apartment (K794) is set out below. Steps up to: Entrance hall. 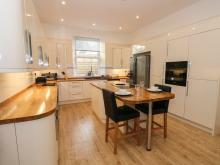 Kitchen, electric range, fridge/freezer, microwave and dishwasher. Separate cupboard with washing machine and tumble dryer. Dining room, large dining table/chairs, Smart TV/DVD player, kitchenette,with boiling tap, fridge, access to patio, seating, sea views. Cloakroom WC, whb. Stairs from ground floor hallway to first floor. Lounge with fantastic sea views, veranda, TV, DVD player, sound bar. Large comfy seating, coal effect gas fire in a marble fireplace. Bedroom 1, with 2 single beds, hanging space, drawers. Bathroom, bath, seperate shower, WC, whb. 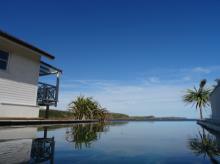 Stairs to second floor: Master bedroom, with fantastic sea views, king-size bed, TV, en suite wet room incl. 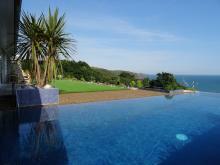 shower, with sea views but private, WC, whb. Bedroom 3, with king size bed, wardrobe. Bathroom, with stand alone bath, separate shower, WC and whb. Stairs to third floor: Bedroom 4, with king size bed, a day bed with a truckle bed available, en suite shower with WC, whb. Bedroom 5, king size bed, en suite shower, WC, whb. 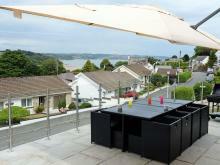 Outside, enclosed terrace with seating, communal garden with original castellated walls and direct access to beach. Balcony with sea views. Parking for ONE car ONLY. Extra cars must be parked in one of the nearby car parks. Cot & highchair available in top floor front bedroom. Two stairgates provided. Rent inclusive of electricity and gas central heating. Duvets, bed linen and towels provided. Wifi throughout. Non-smoking. Friday changeover 4pm takeover. The basement apartment is let separately, unless specifically requested. 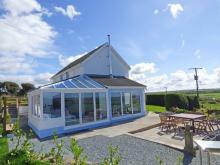 This impressive, colonial-style beach house rests at Freshwater East, Pembrokeshire and can sleep 11 people in 6 bedrooms. 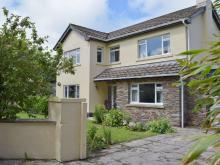 This spacious semi-detached house in Nolton Haven sleeps twelve people in six bedrooms. 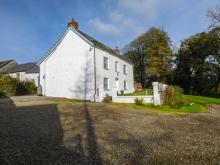 Spacious house, close to village/beach/harbour. Smaller parties welcome. 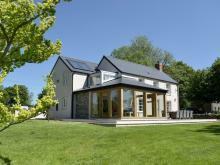 A three storey barn conversion located near the village of Nevern in Pembrokeshire, it can sleep ten people in five bedrooms. 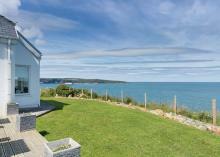 This luxury cottage is situated in the village of Pembroke, near Tenby, and can sleep thirteen people in six bedrooms. 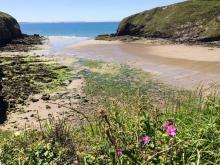 Spacious house with direct beach access. .
A detached house in the Welsh town of Tenby, able to sleep fourteen people in five bedrooms.